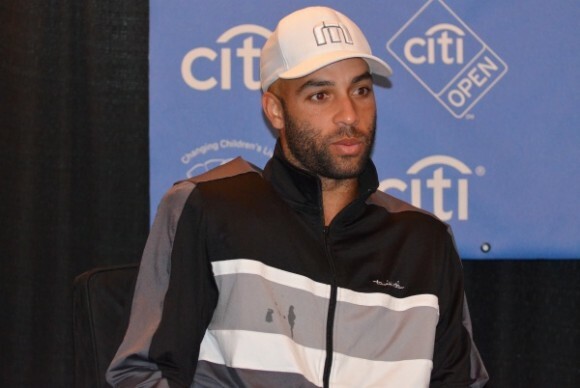 As you may or may not know, earlier this year James Blake joined forces with Athlete Ally, an organization that is striving to end homophobia in sports. Well, when Blake gave a press conferences just moments after his loss to Marinko Matosevic at the Citi Open today, I took the opportunity to ask him about this decision. Photo by Romana Cvitkovic of Tennis Grandstand, 2012 Citi Open. Mardy [Fish] introduced me to the person that was in charge of [Athlete Ally], and they wanted to get more athletes to participate. I couldn’t be happier to be a part of it. It’s something I really feel strongly about. I think it’s something that a lot of people should feel strongly about in the position that I’m in. Honestly, I don’t have regrets in my career. But one regret I do have is that I wish I had more of a voice. I wish I had the titles of Andy [Roddick] or the fame and notoriety of someone more out there in the scene so I could have more of a voice. You know, I can’t worry too much about that. All I can do is use the voice that I have gotten with the wins I’ve gotten and with the position that I’m at in life. It’s something that I feel really strongly about and I’m happy to be a part of it. Thanks for being awesome, James. I only hope that more tennis players will continue to be vocal about this issue! Previous Entry: The Changeover Invades D.C.